Preparing for college has one main problem with it: preparing for the assaults that come your way. This book has just come out, and looks to be a very helpful book dealing with these kinds of issues. It is on special right now at WTS. Dr. Derek Thomas has accepted a call to Columbia, SC to be associate pastor there alongside his longtime friend, Dr. Sinclair Ferguson (now there’s a one-two punch!). This blogger, who has certainly benefited greatly from Dr. Thomas’s books, wishes him all the best. No miser is First Presbyterian Church, to allow Dr. Thomas to go! They will miss him greatly. Speaking of Dr. Thomas, make sure you check out his new commentary on Acts (it has been published, but is not quite yet available at WTS). While puzzling this week over the referent for “these commandments” in Matt. 5:19, I came across two distinct explanations in two of D. A. Carson’s older commentaries. I think they end up in the same place, but they begin quite differently. What do you think? Sean Gerety has posted a thoughtful short essay on saving faith and trust. I thought I would respond to it here and see what people thought about this. First of all, I think two problems are evident. On the one hand, when looking at the Clarkian position, the tendency has been to say that Clark believes in salvation by intellectual assent alone. This is not what Clark is saying. Clark most definitely includes a personal appropriation of the truth of the Gospel when he talks about saving faith. On the other side, when people look at the three-fold definition of knowledge, assent, and trust, that last word is ambiguous. What is trust? Is it a once-for-all entrustment of the soul to God? Or is it a lifelong loyalty to the covenant? Here is where the rubber hits the road. It becomes a little bit more complicated once we introduce the distinction between justification and sanctification into the picture. I would say that if we use the word “trust” in relation to justifying faith (faith as related to justification specifically), we absolutely have to eliminate any thought of life-long loyalty from the discussion, because then we would be justified by loyalty, which obviously includes works of loyalty. So, if we use the word “trust,” then we have to limit it to the once-for-all entrustment of the soul to God. Now, let us relate this once-for-all entrustment of the soul to God, on the one hand, to belief in a personal appropriation of the Gospel, on the other hand. Are they not really the same thing? The former is what most Reformed theologians have said. Clark has said it in the latter way. Might they not actually be the same thing? At this moment in time, I am more inclined to favor the personal appropriation language of belief to describe the third element of faith, precisely since, as Sean has pointed out, the word “trust” is so ambiguous. To conclude, when Clark/Gerety et al say “justification by belief alone” they are not talking about just knowledge, or even just assent. They are also including in that a personal appropriation of that truth to the sinner. I do not see a whopping difference between that and what others have said concerning trust. Are you not placing your trust in God when you come to the belief that God’s Gospel applies to you personally? Maybe the two orthodox sides are not so different after all. It was confidence in God, a positive acknowledgment of God’s power as creator, a calm certainty that God had made known to Abraham his purpose and could be relied on to perform it without further question or condition. Here from another aspect is the same reason why Abraham’s faith should not be though of in terms of covenant loyalty or as incomplete apart from works, for faith is confidence in God’s loyalty as alone necessary, as alone able, as alone sufficient to bring God’s promise to full effect (p. 239 of volume 1). It should be noted here that in the context of Romans, Paul goes on immediately to apply Abraham’s faith as a template or example for us (see 4:23). I should note that this quotation does not alleviate the other problems in Dunn’s theology. However, on this point, Dunn seems to agree with the critics of the FV. Jason Stellman is asking for funds to help fly in key witnesses for the trial of Peter Leithart. If you or your church is able/willing to do this, it would be a great boon, so that the trial can be done correctly (plus, you gotta love the Bartles and James reference!). The point of the Tree is that a consistent thought system can be shown to run organically from “roots” to “fruits.” Not that people generally walk around with well-articulated or particularly consistent thought systems in their heads – but as an apologetic tool, this graphic organizer can be used to visually emphasize inconsistencies in somebody’s system (e.g., the fact that certain “fruits” were stolen from the Christian Tree and duct-taped onto a non-Christian one) and also to display the beautiful consistency of the biblical worldview. As a teaching tool for Christians, the Tree can be used to present identifiable worldly thought systems over against the biblical view of reality, and it can be used to organize data gathered from a speaker or author in order to figure out what Tree he or she is sitting in. (Main branchy area) AXIOLOGY: What is right and wrong / good and bad? (Trunk) ANTHROPOLOGY: What is a human being? 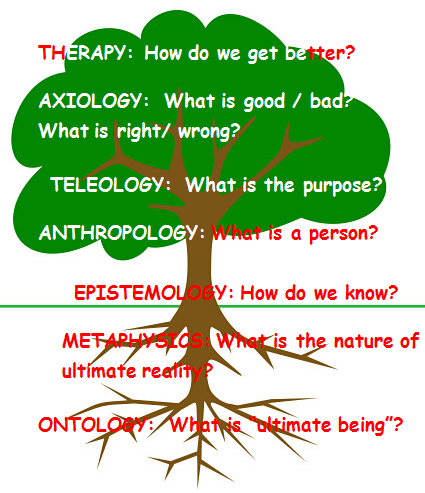 (Ground line) EPISTEMOLOGY: How do we know things? Now, you can just cut and paste bits of that list to fill out your own Tree, as I have done in the first comment below. Don’t even worry about the html stuff – I’ll come back through and set that up for you after the fact. Just plant us a Tree! Share around your knowledge a bit. Here are some interesting sources of thought systems to start with – feel free to borrow from this nursery, or come up with your own variety. No need for doctoral dissertations here, either; these are just saplings after all. Just give us the main ideas (in your own words, unless otherwise noted or you know some good quotes). And leave blank what remains unknown if necessary. I am becoming more and more convinced that the Federal Vision believes in two baptisms. Consider this point: do they expect an infant baptism to work the same way an adult baptism would? This presupposes another question, of course: should our doctrine of baptism be able to take into account all baptisms? The answer to this latter question is yes, since we believe in one baptism, as Ephesians 4:5 tells us, and as the creeds tell us. So the problem for the FV is this: if the sign and the thing signified are tied so closely together that you can’t even insert a credit card in between the two, then how to explain adult baptisms? Does the adult get the thing signified at the time point of faith, or do we have to tell him, “Whoa there, slow down, pardner! You don’t have union with Christ and forgiveness of sins until you’re baptized.” Isn’t that telling an adult that faith alone is not sufficient for justification? Let’s try a thought experiment that seeks to make infant baptisms and adult baptisms work the same way. Let’s suppose that an adult comes to faith before he receives the sign and seal (like Abraham in Romans 4, for instance). Could this be paralleled in an infant’s life? Sure thing. An infant can trust in its Creator even in the womb (an implication of John the Baptist, not to mention David’s strong language of infant faith in the Psalms). Okay, what about coming to faith after baptism, can that happen? This is also very possible. An adult can fool himself into thinking that he has real faith, and only realizes his mistake after baptism. We would certainly not re-baptize such a person. His faith came after the sign and seal. This also happens with infants, since it happened with me. I came to faith when I was six, though baptized as an infant. And no, no one doubted my words when I said I came to faith. I was always encouraged to hold to what I said. I was encouraged both before and after my conversion to grow up in the nurture and admonition of the Lord. My parents did not assume one way or the other whether I was saved or not. In other words, I myself do not fit the FV paradigm. If one believes, then, that the thing signed and sealed always comes at the time-point of baptism, then one believes in two baptisms, because it never happens that way with an adult, and almost never with an infant. Would a church responsibly baptize an adult who did not have a credible profession of faith? Of course not. In baptizing an adult, the church is required to assume that the thing signified is already present. Therefore, the FV believes in two baptisms. It works one way for infants, and another way for adults. This is not tenable, and it is certainly not confessional. The Westminster standards says that the efficacy of the sacraments is not tied to the moment when they are administered. It comes in God’s own appointed time. That appointed time is when the Holy Spirit comes upon the person in power and changes that person from a citizen of Hell to a citizen of Heaven. That happens by faith alone. This is why saying that sign and thing signified always or even mostly occur at the same time is very dangerous. Whenever God gives faith-that is when the thing signified and sealed is granted. God is not tied to the moment of baptism to give that. One commenter long ago wrote on this blog that the FV is a baby-driven theology. I think this is true. Rather than coming at the sacrament in such a way that all forms of it fit the same template, so as to have only one baptism, they think almost exclusively in terms of how a baby experiences baptism, and it is not consistent with how the adult baptism works. They should work the same way.